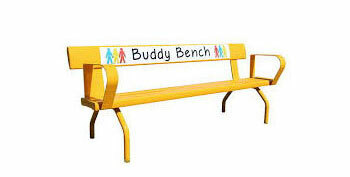 The Buddy Bench is being introduced to playgrounds following its success at a school in Cork. It came about following the concerns of a parent after her son told her that he didn’t have anyone to play with at break time. Everyone else had someone to play with but his two friends were off school poorly which left him alone, feeling isolated and upset. The parent recalled reading an article about Buddy Benches and suggested to other parents and the Head Teacher that they should consider something similar to avoid other pupils feeling the same way. The response was a resounding ‘Yes’. Quite simply the Buddy Bench is there if a child feels lonely, being in this space (on the bench) signals to other pupils that they would like someone to play with and wish to be included in their group and games. But there is a broader goal as explained by Judith Ashton, a psychologist and co-founder of social enterprise Buddy Bench Ireland “We use the bench as a reminder for children of things like communication, mutual support and opening up about feelings.” The benches are introduced into the school alongside workshops and role-plays, the children learn a song that reminds them to "look up, look around and look out for each other". The Buddy Bench is reducing social isolation and improving mental wellbeing. For me adopting Judith’s approach is the right way to go, educate everyone, pupils, parents and teachers, that the bench is to be associated with positive outcomes, both emotional and practical which will avoid ‘the bench’ having a negative association and stigma. The Buddy Bench has evolved from Friendship Benches which originated in Zimbabwe as an alternative approach to dealing with mental healthcare. A trained, but unqualified healthcare worker, known as a ‘Grandmother’ will sit on her bench and listen to the stories of residents who would not usually have access to mental health support. The Friendship Bench Programme was a local solution to a growing problem, which has changed the lives of thousands of people. As is often the case the simplest ideas are sometimes the most effective. The ‘bench’ has proved to be an innovative and affordable way of providing support in the community to those who are vulnerable. The evidence suggests that all ages can benefit from having a place they can go to feel secure and know that someone is there to listen.